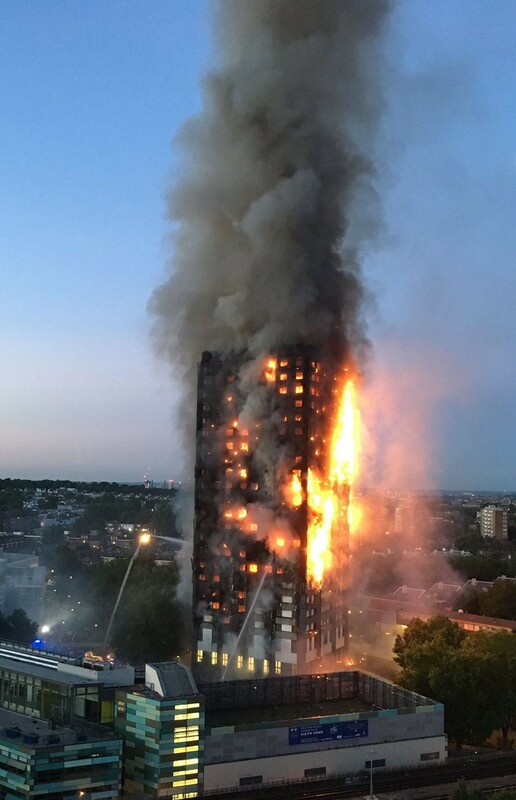 England’s 2017 Grenfell Tower Fire – Never Again Elsewhere ?? As we approach the First Anniversary of the Grenfell Tower Fire Tragedy, in England, on 14 June … a few days ago, on 4 June 2018, the first batch of Grenfell Expert Witness Reports were uploaded (https://www.bbc.com/news/uk-44356660) to the Grenfell Tower Inquiry Website (https://www.grenfelltowerinquiry.org.uk/) for public view. At this time, in London … multiple, fragmented investigations are taking place into the actual fire incident … the role of the Local Authority, and building management … those involved in the refurbishment (‘tarting up’) design and construction … the fire services, particularly their ‘Stay Put’ Policy and how it adversely impacted on vulnerable Tower occupants during the emergency … and the highly flawed regulatory model of Building and Fire Codes with light-touch Control, which is still operating in England. One of Murphy’s Laws immediately springs to mind with regard to the intended ineffectiveness of this overly-complex process ! 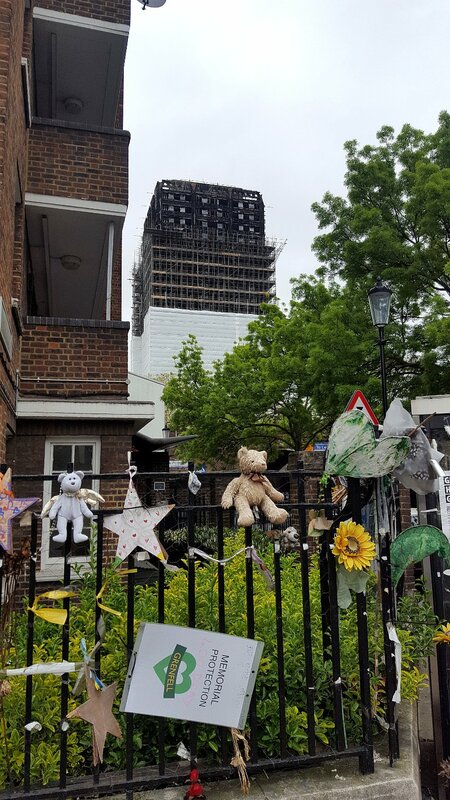 Colour photograph showing Grenfell Tower in the background … undergoing an almost complete ‘cover-up’ … with, in the foreground, mementos of the Fire Tragedy fixed to railings by local residents. Click to enlarge. Photograph taken by CJ Walsh. 2018-04-29. 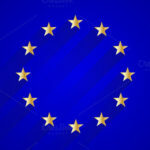 Many other countries have adopted some or all of this modern English regulatory model which, after the repeal of an older Bye-Law format, has been shaped by political expediency, cost-effectiveness and general ineptitude … with little or no adaptation to local conditions in the adopting jurisdictions. Ireland adopted this model with some, but not a lot, of adaptation. Fire Safety In Ireland ? 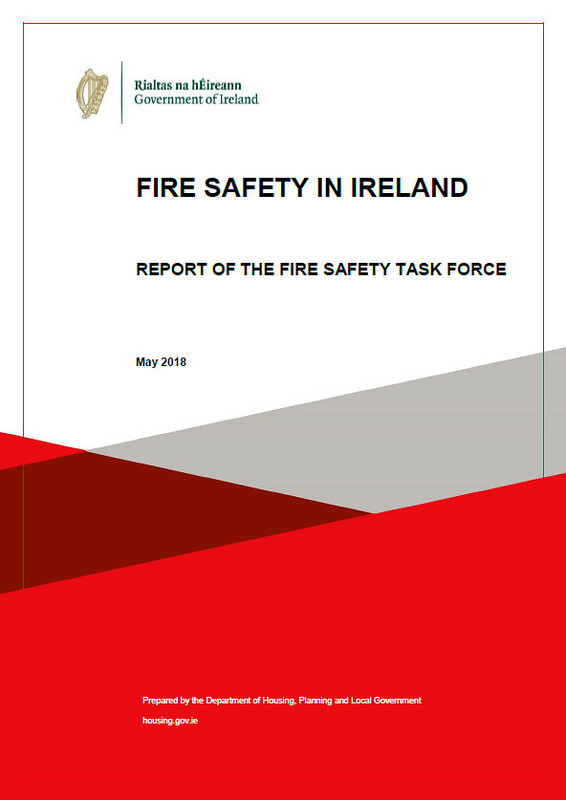 On 6 June 2018 … while that investigative activity was hitting the headlines in England … Minister Eoghan Murphy, T.D., Ireland’s Minister for Housing, Planning and Local Government, quietly published the Report: ‘Fire Safety in Ireland’ … http://www.housing.gov.ie/local-government/fire-and-emergency-management/fire-safety/eoghan-murphy-publishes-report-fire … by a High-Level Task Force within his Department’s National Directorate for Fire and Emergency Management, after serious concerns and fears had been expressed in the public media that a similar fire tragedy might also occur in this jurisdiction. To be crystal clear … this Report is a Bureaucratic Whitewash … an insult to the Public ! Nice sounding technical ‘blarney’ camouflages a failure to deal directly with critical issues, and answer concerns … while other important issues are avoided altogether. A. Initially, Irish Local Authorities were requested to carry out a preliminary survey to identify all buildings of more than six storeys, or 18m in height. Specifically, they were asked to identify those buildings which had an external cladding system which might be a cause for concern. This height threshold of six storeys/18m is arbitrary … an external cladding system can be just as much a cause for concern in a building which is lower. Imagine discarded cigarette butts or a rubbish fire at the base of such a system … and the resulting speed of fire spread and development across a building façade ! B. 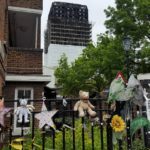 The highly flawed regulatory model of Building and Fire Codes, with light-touch Control, which resulted in the Grenfell Tower Fire Tragedy … we also have. Wake up and smell the coffee Ireland ! At the beginning of the 1990’s, when Ireland had been persuaded by the European Commission to finally introduce legal, national building regulations having a functional format … our National Authority Having Jurisdiction, in desperation, grabbed the then Approved Documents for England & Wales … brought them back to Ireland, put Irish covers on them, and originally called them ‘Technical Documents’ … but, after seeing a tiny ray of inspiring light, later changed their title to the more accurate ‘Technical Guidance Documents’ ! This hunger for adopting all things English which are fire safety related continues to this day … with a similar, ongoing division of Technical Guidance Document B: ‘Fire Safety’ into 2 Separate Volumes. This may have been a convenient response under pressure … but it has been very short-sighted. 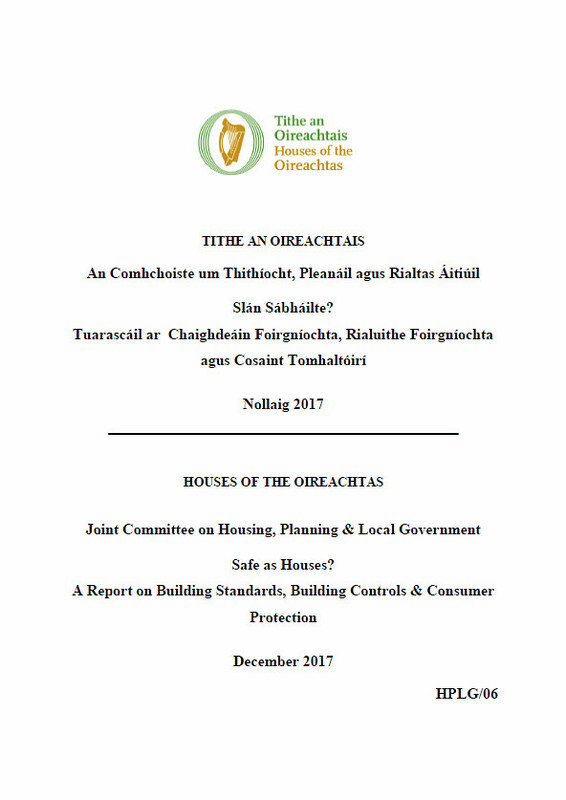 It has impeded the growth of a comprehensive and coherent philosophy on Safe, Inclusive, Age-Friendly, Resilient, Sustainable Planning, Design and Construction Codes/Controls which is suited to an Irish context and responsible local needs (not desires!). C. Everywhere … this Report has a lot – too much – to say about Fire Risk Assessment ! 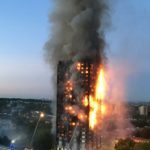 After the Grenfell Tower Fire, however, Fire Risk Assessments must only be carried out by competent persons … and the process of Fire Risk Assessment, itself, must be radically improved ! And of course, prior to any Risk Assessment … a proper Fire Hazard Appraisal must be carried out. 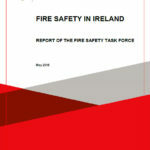 D. To accurately present Fire Safety Trends in Ireland … it is not enough to furnish reliable fire fatality statistics. It is also necessary to produce reliable fire injury statistics … and reliable information on direct/indirect socio-economic losses. E. The quality of fire safety related construction on Irish Building Sites continues to be very poor and problematic. Fire Compartmentation is nowhere near being adequately – never mind acceptably – reliable ! And during the last few years we have had quite a number of close-calls concerning fire incidents in medium-rise residential buildings. F. Fire Evacuation for people with activity limitations is still handled atrociously in our current building regulations. This is ironic because, on 20 March 2018 last, Ireland had to be dragged screaming to ratify the U.N. 2006 Convention on the Rights of Persons with Disabilities (CRPD) ! Positive Progress By Another Path ! 1. 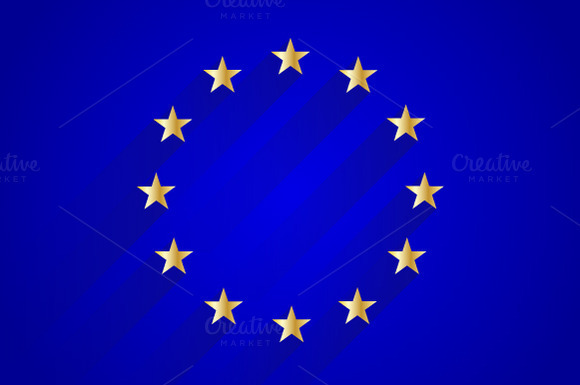 Abandon the outdated English functional requirements in THEIR building regulations … and adopt a far better, more up-to-date body of functional requirements which is already on the Irish Statute Books … Annex I of the European Union’s Construction Products Regulation 305/2011. And because there are important horizontal linkages between requirements … immediately finish the ridiculous current separation between Fire Safety requirements and all of the other requirements. And yes … new Technical Guidance Documents will have to be drafted. 2. Yes … ‘Persons Having Control’ of buildings have responsibilities with regard to fire safety. But that is only one side of the coin ! National and Local Authorities Having Jurisdiction have greater responsibilities. If we are at all serious about Consumer Protection … bad, inadequate, faulty construction must be prevented beforehand … it is too late, too costly and, in many cases, too impractical to correct afterwards. Self Regulation by building design professions and construction organizations is NO Regulation ! 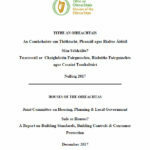 Stringent, independent technical control inspections must be carried out on all projects by Building Control personnel … which used to happen in Dublin City/County and Cork City/County prior to the introduction of legal building regulations in the early 1990’s … and, depending on complexity, must also be carried out at critical stages during the construction process. Building Control Sections in all Local Authorities must be properly resourced with competent personnel, equipment, training and support infrastructure. Inspections concerning compliance with all functional requirements in the building regulations, including fire safety, must be carried out only by Building Control Personnel. Chief Fire Officers must not be allowed to manage or be involved in any aspect of Building Control. On the same project … a Disability Access Certificate Application and a Fire Safety Certificate Application must be inter-linked and overlap sufficiently, showing no gaps in compliance. Inspections must be carried out in connection with all Certificate Applications. Building Control personnel must satisfy themselves that actual construction at least matches, if not improves upon, what is shown in design documentation. Building Control Inspection Reports must be made available for public view. 3. Firefighters are NOT a disposable Social Asset ! National and Local Authorities Having Jurisdiction … and some Chief Fire Officers … must begin to understand this fundamental truth ! Fire Services in all Local Authorities must each be properly resourced according to local needs … with competent personnel, equipment, training and support infrastructure. Shared provision of resources looks very neat on paper but, in practice, works very badly. Refer to the Grenfell Tower Fire and London Fire Brigade having to borrow firefighting equipment from other Fire Services. After the 2015 Tianjin Regional Fire Devastation, in China, and the 2001 WTC Attacks on 9-11, in New York City … front line firefighters must be supported by Specialist Hazard Appraisal and Structural Engineering Units. For Firefighter Safety in buildings and to quickly find people with activity limitations waiting in Areas of Rescue Assistance and/or other survivors in different locations … a portable and reliable Thermal Imaging Camera is an essential piece of every firefighter’s equipment. And Firefighter Safety begins with good building design. In all but the most simple building types, Circulation Routes must be designed for Contraflow … people moving away from a fire in a building and towards safety while, at the same time, heavily equipped firefighters are entering the building and moving towards the fire. 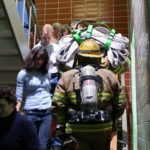 Colour photograph showing Contraflow on a building staircase … people moving down a staircase away from a fire and towards safety while, at the same time, heavily equipped firefighters are moving up the staircase towards the fire. Click to enlarge. There is no place for ‘Stay Put’ Policies in Irish Residential Buildings of any height. This was a good effort by our public representatives … but they missed core issues ! After The Grenfell Tower Fire ! The 2017 Fire in England was not an extraordinary fire. Since the beginning of this decade, we continue to see a series of such fires: South Korea (2010) – UAE & France (2012) – Chechnya (2013) -Australia (2014) – UAE, Azerbaijan & UAE again (2015) – UAE (2016) – UAE & Russia (2017) – Turkey (2018). With regard to Command & Control of Large Scale Emergencies … English AHJ’s should have paid attention to the 2005 & 2008 U.S. National Institute of Science & Technology (NIST) Recommendations following the 9-11 WTC Buildings 1, 2 & 7 Collapses. Only insofar as it is necessary to protect the lives of able-bodied building users/occupants … is there a concern for property protection. There is only inadequate, token concern for the protection of people with disabilities. Client organizations, facility managers, building designers, construction organizations … and journalists … must fully comprehend these limits. In the photograph below … look closely at the External Firefighting Operations at the bottom of the Tower. There are limits to what can be achieved from outside a building ! Colour photograph showing the developed fire at Grenfell Tower, in London. At the bottom of the Tower, external firefighting operations can be viewed. Click to enlarge. A Fire Suppression System (Water Sprinklers/Mist/Hybrid) is an essential Fire Protection Measure in ALL Medium and High-Rise Residential Buildings … which include Apartment Blocks, Hotels, Hostels, Student Accommodation & Social Housing, i.e. ANYWHERE there is a Sleeping Hazard. A Reliable and Credible Fire Detection & Warning System is an essential Fire Protection Measure in ALL Buildings … and must be capable, under the control of Building Management, of transmitting warnings in many formats, i.e. Audible + Visual + Multi-Lingual Voice + Tactile. Fire Evacuation Routes in Buildings must be designed for CONTRAFLOW … people moving away from a fire and towards safety while, at the same time, heavily equipped firefighters are entering the building and moving towards the fire. Good Fire Evacuation Route Design is INTUITIVE and OBVIOUS. In many buildings, however, this is not always the reality. Effective Fire Evacuation Signage … comprising high-level signage, low-level signage, with both supplemented by photoluminescence … must be installed in ALL Buildings. 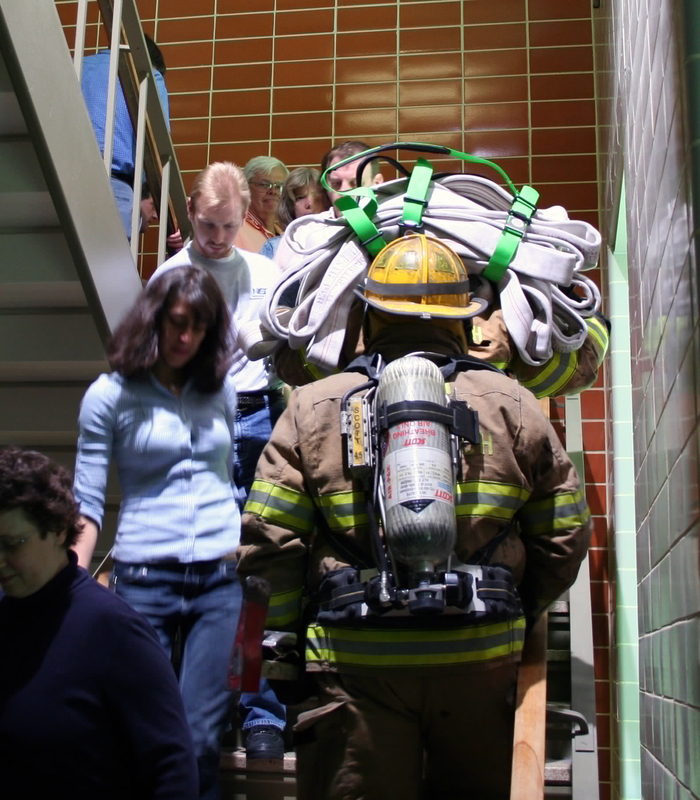 For the purpose of protecting Vulnerable Building Users in Fire Emergencies, ALL Lifts/Elevators in Buildings must be capable of being used for Evacuation. Fire Risk Assessments must NO LONGER be carried out by people WITHOUT COMPETENCE in Fire Engineering AND Building Design & Construction … and the Fire Risk Assessment Process itself must be thoroughly re-examined and upgraded.